The Centre for Medieval Studies and the Department of English (UTSG) cordially invite all those interested to the Toronto Old English Colloquium 2017, scheduled for Tuesday, May 9th. The event is free of charge and all are welcome and encouraged to attend. The detailed program can be consulted below. “The 2017 meeting was a great success, with 468 attendees, three plenaries, fifty-one concurrent sessions, receptions in art-filled venues, and, after several days of rain and snow, two final days in the sun. The opening plenary, “The Cairo Geniza and the Middle East’s Archive Problem,” was delivered by Marina Rustow (Princeton University), who demonstrated how methodologies used to study western European manuscripts can be applied to fragmentary manuscripts of the Middle East and Asia, with stunning and innovative results. MAA President Carmela Vircillo Franklin (Columbia Univ.) delivered her plenary lecture on the editorial history of the Liber Pontificalis, focusing on Francesco Bianchini’s 1718 edition, an innovative volume that included drawings and diagrams in support of his editorial arguments. The Fellows’ Plenary was to have been delivered by Monica Green (Arizona State University). In Prof. Green’s unfortunate absence, Jonathan Hsy (George Washington Univ.) bravely stepped in to deliver her paper in her stead, while Prof. Green followed along online and answered questions that were live-Tweeted to her using #MAA2017. The CARA plenary session addressed the topic of “Mediterranean Sexualities.” Roundtables were held on the timely and important topics of open-access publishing, diversity in curricula and on campus, Medieval Studies in K-12 curricula, and careers off the tenure track. The full program is available here. 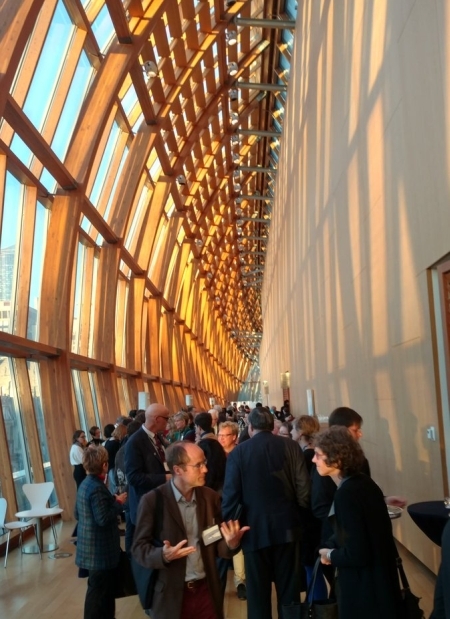 Receptions were held at Victoria College, the Art Gallery of Ontario, and the Aga Khan Museum. Four publication honors were awarded during the Presidential Plenary session. The Van Courtlandt Elliott Prize was awarded to Rosemary O’Neill (Kenyon College) for her article, “Counting Sheep in the C Text of Piers Plowman,” The Yearbook of Langland Studies 29 (2015), 89-116; John Nicholas Brown prizes were awarded to Jacqueline E. Jung, The Gothic Screen: Space, Sculpture, and Community in the Cathedrals of France and Germany, ca. 1200-1400 (New York: Cambridge Univ. Press, 2013) and to Jonathan R. Lyon, Princely Brothers and Sisters: The Sibling Bond in German Politics, 1100-1250 (Ithaca: Cornell Univ. 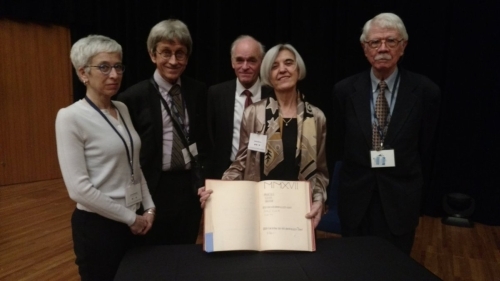 Press, 2013); the first annual Digital Humanities Prize was awarded to DigiPal: Digital Resources and Database of Palaeography, Manuscript Studies and Diplomatic; and the Haskins Medal was awarded to Joel Kaye, A History of Balance, 1250 – 1375. The Emergence of a New Model of Equilibrium and Its Impact on Thought (New York: Cambridge University Press, 2014). The annual meeting of the Committee on Centers and Regional Associations (CARA) took place on Sunday morning and was attended by thirty CARA delegates, each of whom was there representing their program or department. The morning began with a roundtable on collaborations between scientists and medievalists (in this session, Monica Green’s paper was delivered by Patrick Geary (School of Historical Studies, Institute for Advanced Study)). Profs. Green and Geary presented on their respective paleogenetics projects. In collaboration with geneticists, Prof. Green is exploring the identification and spread of medieval pathogens and Prof. Geary is studying human migration in the early Middle Ages. Alexandra Gillespie (Univ. of Toronto) presented projects being developed in the University’s Old Books New Science Laboratory. The roundtable was followed by a discussion and brief updates from each delegate. A graduate student workshop on the identification, cataloguing, and TEI-transcription of manuscript fragments took place at the Pontifical Institute of Mediaeval Studies during the Annual Meeting, a workshop that grew out of the “Digital Editing the Medieval Manuscript Roll/Fragment” workshops previously held at Yale University and University College London. These workshops were partially funded by a Medieval Academy/GSC Grant in Innovation. See digitalrollsandfragments.com for more information about this project. The Centre is soliciting one-page abstracts from CMS students for 30-minute papers dealing with any aspect of medieval studies. Submissions for papers on any topic are welcome: history, literature (Latin and/or vernacular), art history, philosophy, music, medicine, etc. The colloquium is sponsored jointly by the a.r.t.e.s. Graduate School and the Zentrum für Mittelalterstudien (ZEMAK) of the Universität zu Köln, and the Centre for Medieval Studies of the University of Toronto. This year the colloquium will take place in Cologne 9-11 November. Six papers by students of each institution will be presented and commented on by professors of the other institution. The aim of the colloquium is to foster discussion and exchange among graduate students and faculty from both institutions. The flight and accommodation costs of Toronto students will be covered jointly by CMS and ZEMAK. This is the fifth colloquium in the series, which alternates between Cologne and Toronto. The University of Cologne is one of the most important German centres for the study of the Middle Ages and shares many ties with CMS. Participants in past colloquia have benefited from the commentaries of scholars from a different academic culture and from the opportunity to build academic networks in Europe. A strong contingent of faculty members and students at the Centre for Medieval Studies will be presenting papers or organizing sessions at the 52th International Congress on Medieval Studies at Kalamazoo, May 11-14 2017. It’s “Toronto night” at the festival! Toronto’s Pneuma Ensemble shares a period musical presentation of the first extant romance in English, before the venerable PLS performs Colleen Butler’s new translation of Hrosvit’s tenth-century tragicomedy about the Roman emperor lured into carnal embrace with cookware. Congratulations to Nick Everett for his new book! Nicholas Everett, Patron Saints of Early Medieval Italy AD c.350-800: History and Hagiography in Ten Biographies, a translation with a commentary and introduction, Durham Medieval and Renaissance Texts and Translations 5, Pontifical Institute of Mediaeval Studies Press, 2017. 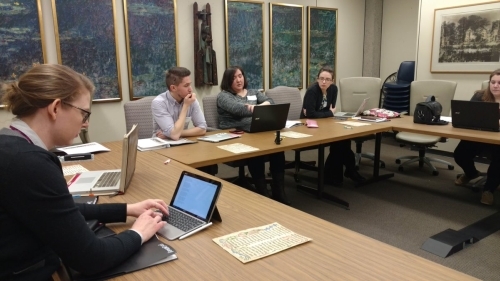 In 2016, the Centre of Medieval Studies was chosen as one of three University of Toronto humanities departments to become part of the TRaCE project, a Canada-wide collaborative project involving twenty-five universities. The aim of the project was to collect data on the careers of PhD students in the humanities who graduated between 2004 and 2014, interview them about their past and present professional experiences, and reconnect them to the university. This research was conducted by Lochin Brouillard, a PhD candidate at the Centre, who compiled the trends emerging from the interviews in the report linked below. Narratives of CMS alumnae and alumni, including Damian Fleming, Victoria Goddard, Helen Marshall, and Connell Monette, have also been published on the TRaCE website. The Centre’s active role in the TRaCE project provides us with the means to pursue our ongoing effort to foster links among all members of our community – graduates, students, faculty members, and research associates. For a full report on the TRaCE activity at CMS, see the TRaCE Report compiled by Lochin Brouillard.